We are now ready to promote the launch of our new website and web address www.cadenhead.scot – we hope you like the new site and will visit us regularly. The site will be continually evolving, with the main task being that we have to add historical stock to the Bottling Archive. This will be an ongoing and long lasting process, meaning that you can check back regularly to see what new (and by “new” we mean old) bottlings have been added. 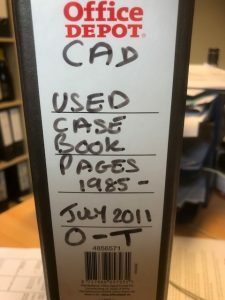 This does cause us several problems, one of the main ones is that a lot of the information is still on paper in a folder such as the one in the picture – incase you don’t know what a folder is- which means we will have have to manually enter all of the old bottling information. When I say we – I probably mean Nathan and Mitch! If you have any feedback on the site or have any suggestions for topics that you would like us to cover in blog posts please do not hesitate to contact us.